The subject of the issue is “Russia is ill: doctors and diagnosticians”. There are many who are willing to give diagnosis, both inside and outside of Russia. Where does such a desire stem from? Who has the right to be a diagnostician? What does "healthy society" mean? 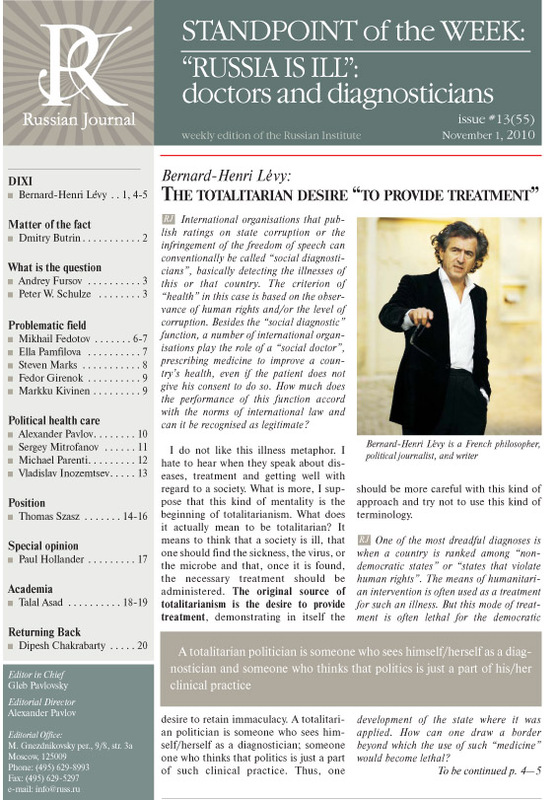 These and other questions are answered by the following experts: Bernard-Henri Lévy – a French philosopher, and political journalist; Thomas Szasz – a leading activist of the anti-psychiatric movement; Talal Asad – a professor at the New York University; Vladislav Inozemtsev – an economist and political scientist; Mikhail Fedorov – Chairman of the Council on Assisting the Development of Civil Society and Human Rights Institutions under the President of the RF; Ella Pamfilova – a Russian public figure; Dmitry Butrin – the head of the department at the “Kommersant” newspaper.